I figured I would post some photos to show my progress along the way. They're not so great yet, but if I do this every month or so, I think I'll like what I see a lot more! The next picture is from the October/end of October time period. This is a trip to a winery with some friends, a good time all around. Still not proud to show off pics, but I think a definite improvement over the previous. At this point, I am probably around 280-285. This is in the range of 15lbs lost since I weight myself and started this in mid-September. 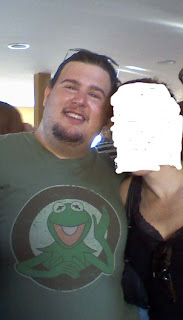 This final picture is from recently (last week), around 265lbs. I mustered up the courage to take the shirt off! From now on, that is how I will take pics so I can see better what kind of progress I am making. I'll try to do this monthly! Gotta Get Back on Track!